When volatility rears its ugly head as it did on Tuesday with the Dow Jones Industrial Average falling as much as 200 points, this can be a beautiful thing to the short-term trader. Direxion Investments’ leveraged and inverse products, in particular, have given investors access to an investment space that was typically relegated to only high-net worth individuals or institutions. With the transparency and liquidity of an ETF wrapper that incorporates multiple hedge fund strategies, Direxion opens up the arena to all types of investors irrespective of net worth. 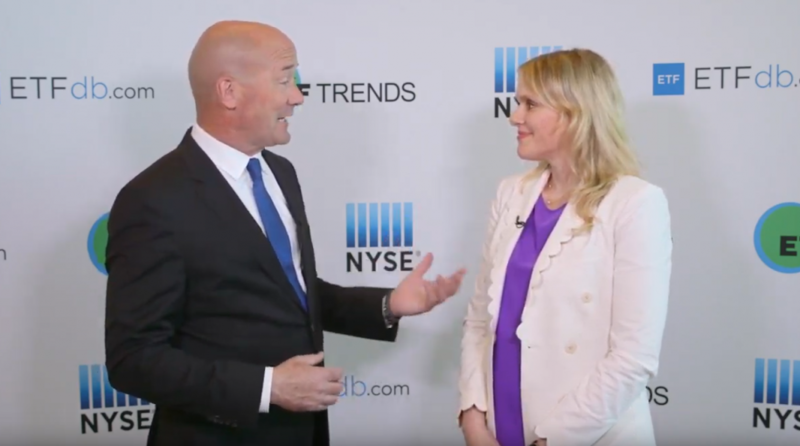 “I like to think that we’ve democratized leverage so that RAs and family offices that can’t have access to the tools that hedge funds do–they don’t have prime brokerage accounts, they don’t trade options, they might be constrained by certain things–have this opportunity to generate those types of gains and hedge,” Sylvia Jablonski, Managing Director, Capital Markets – Institutional ETF Strategist, told ETF Trends at Inside ETFs. Jablonski cites education as a prime catalyst for investors no longer buying and holding the short-term trading products and rather, using them for what they’re intended to do. With Direxion’s expansive library of education materials at investors’ disposal, it can provide them with the confidence to trade tactically with the big players like institutional investors. With the return of volatile markets, traders can now implement what they’ve learned thus far. For EM investors who have stuck with the space for the last five years, 2019 can almost be seen as a year of retribution thus far. As such, Jablonski recommends looking at the Direxion Daily MSCI Emerging Markets Bull 3x Shares (NYSEArca: EDC). “Emerging markets have been massively beaten down,” said Jablonski. “They’re at a multiple of 9 or 10, they’ve had some fiscal discipline and because they’ve been beaten up for so long, as we see this global slowdown, those markets, which tend to do better, might outperform in coming years. Jablonski recommends looking at the Daily Robotics, Artificial Intelligence & Automation Index Bull 3X Shares (NYSEArca: UBOT), which could lead the next technology revolution of tomorrow. UBOT seeks daily investment results equal to 300 percent of the daily performance of the Indxx Global Robotics and Artificial Intelligence Thematic Index, which is designed to provide exposure to exchange-listed companies in developed markets that are expected to benefit from the adoption and utilization of robotics and/or artificial intelligence. For investors who missed out on the serendipitous run of FAANG (Facebook, Amazon, Apple, Netflix, Google) stocks, they can look to capitalize on disruptive tech options of the future. “‘What’s the next tech story?’–that’s what people ask us,” said Jablonski. “You have robotics, you have medical robots that do surgeries, you have AI in factories, you have an aging population being replaced by robots–I just think that space is going to be huge,” Jablonski added.